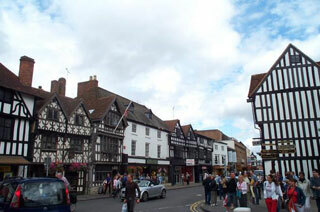 Stratford-upon-Avon is a market town originally inhabited by Anglo-Saxons and remained a village before the lord of the manor, John of Coutances, set out plans to develop it into a town in 1196. The town is a popular tourist destination owing to its status as birthplace of English playwright and poet William Shakespeare, and receives approximately 2.5 million visitors a year. This article uses material from the Wikipedia article "Stratford-upon-Avon", which is released under the Creative Commons Attribution-Share-Alike 3.0 License.